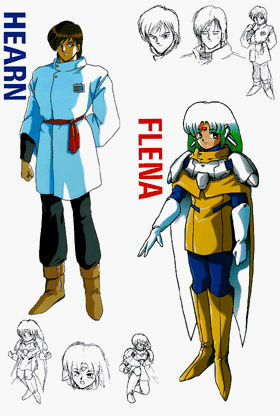 The sixth piece in a series of eight featuring the main party members of Phantasy Star IV highlights both Hahn and Demi. More odd Japan name romanizations are used, continuing the offbeat theme of this series of pictures. Again, we have small sketches of the characters. Sadly, these sketches are not shown larger anywhere in this collection. You may view the gallery page for Hearn & Flena. Awesome, I'm loving the Hahn picture. Love these names, Flena and Hearn!